I'm going to walk you through this assignment because it's totally worth it. The pictures aren't the best, but you will get the idea and be able to create one on your own. I found the idea a few weeks ago on an online art gallery, possibly Artsonia....I actually can't recall! However, I'll walk you through the way I did with my kids. 1. Start with a paper plate. It needs to be upside down (dome-like). 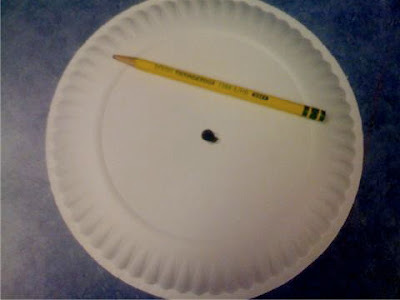 Find the center, poke a good sized hole with your pencil. 2. 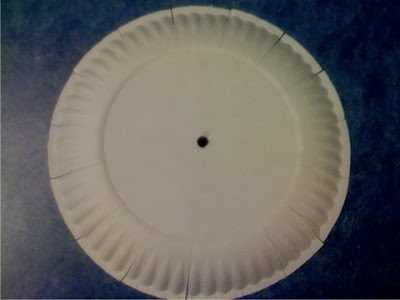 Use scissors and cut even slits around the outside rim of the plate. If you're using the same type of plates I used (the cheap kind!) then you can have them count the 'bubbles' in between to keep it even. 3. Cut yarn about 6-7 inches. You will need as many pieces as the number of slits you cut. 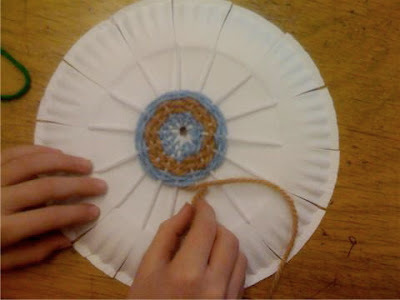 I had my students use either black or white yarn, no "colors" for this part. 4. Put one end of the yarn through the hole, and the other through the slit. 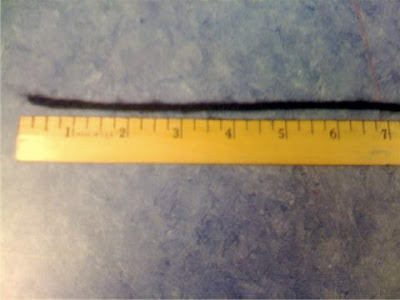 Tie in a knot on the back (which is actually the front of the plate). Do this the entire way around. It does take some time! 5. Begin weaving. 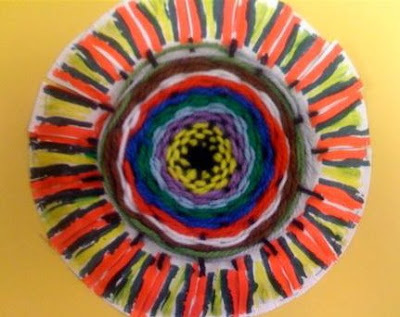 Start in the center with whatever color the students would like for their design. I recommend only starting with about 12 inches of yarn in that color. Pull the string through just tucking away the end, and begin to do an over/under/over/under pattern going around the paper plate. After each revolution, push yarn down towards the center (to keep it tight). When finished with that color, start another color where that one ended, and continue out to the edge. 6. 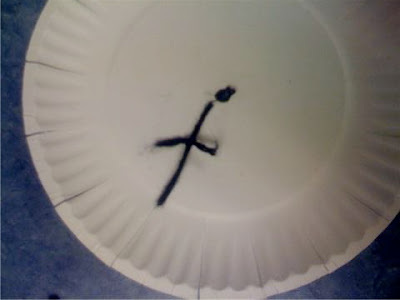 Final Product: Use markers that match your design, and create any design around the edge of the paper plate. Staple to background paper for the final finished look! Enjoy!! The kids LOVE this. My kids are all wanting to learn how to knit because it is getting cold here.I know that they don't have the fine motor skills to cope with that. Their anxiety will go through the roof! I do think they will enjoy working with wool this way if I prepare the plate for them first. Thanks for the idea. 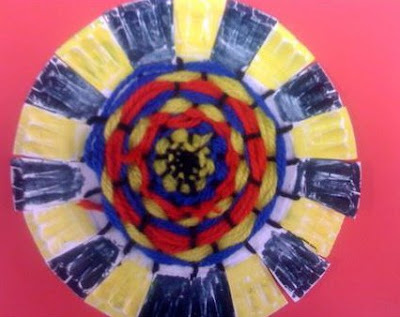 Along with this group project students have been making paper plate mandalas. I wanted to see what else was out there for directions, and found yours. I actually had a student who created this design on his own! 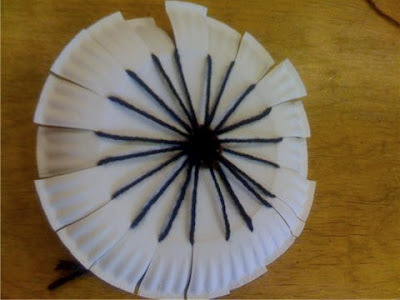 He used a piece of corrugated cardboard cut into a circle, then the same as yours. The REALLY important part of the mandala recipe is the be sure that there are an odd number of warps or spokes in your wheel. If not, the over/under pattern will not alternate. I have a question.....I'm wondering if you cut the yarn ahead of time for them to use? Also, did they have a problem preparing the paper plate (cutting)? I did this project with my 4th graders last week and they loved it! I really like the addition of the marker design along the border!!! How many class periods did this take you?